Departure From: Hotels in Jerusalem, Tel Aviv, Herzliya and Netanya. 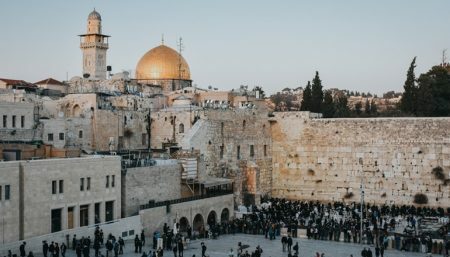 Mark the Christmas holiday with a tour of Jerusalem and Bethlehem that culminates with a festive dinner and midnight mass outside the Church of Nativity. The top sites visited on this tour are: Mount of Olives, Church of the Nativity, Festive dinner in Manger Square, Midnight Mass. The tour will take place on December 24. This tour is not available for Israeli passport-holders due to the restrictions of Israeli law. The Palestinian Authority is solely responsible for the organization of Christmas festivities in Bethlehem. Bein Harim or itraveljerusalem is not responsible if changes to the Christmas program affect aspects of the tour. Bein Harim is not responsible for participants who arrive late to the meeting point.